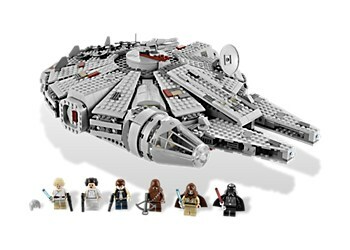 A vice president with a California software company has been busted running an elaborate Lego eBay scam. 47-year-old Thomas Langenbach is Vice President of the Integration and Certification Center at Palo Alto-based SAP Labs LLC. He's been with the company since 1988, according to his LinkedIn profile, and joined SAP Labs' ICC in 2000. He holds a degree in computer science and business administration from Berufsakademie Mannheim in Germany. He's also a Lego criminal mastermind. He's not made of Lego, to be clear. Rather, he was busted putting fake, "sophisticated" bar codes on boxes of Lego sets at various Target stores, which allowed him to purchase them for far less than their real prices, and then turned around and sold them on eBay for a big profit. Among his scores were a $279 Millennium Falcon set that he bought for $49, and an Anakin Skywalker set normally listing for $90 than he got for $35. And while it may sound a little rinky-dink, it was actually a very lucrative and busy enterprise. A search of his "multimillion dollar San Carlos home" turned up "hundreds and hundreds" of Lego boxes, and police said he's sold roughly 2100 Lego items worth $30,000 through his now-closed "tomsbrickyard" eBay store. Police caught on to Langenbach's scheme thanks to Target's in-store security, which apparently pays very close attention to Lego sales as a matter of routine; as police spokeswoman Liz Wylie explained, "Legos are very popular and expensive." He's currently facing four counts of burglary, but could be on the hook for more as police are still trying to separate the stolen Lego items from those he may legitimately own.